BOOSTRIX was administered concomitantly with FLUARIX® (Influenza Virus Vaccine) in a clinical study of subjects 19 to 64 years of age [see Clinical Studies (14.5)]. 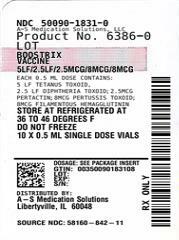 Lower GMCs for antibodies to the pertussis antigens filamentous hemagglutinin (FHA) and pertactin were observed when BOOSTRIX was administered concomitantly with FLUARIX as compared with BOOSTRIX alone. It is not known if the efficacy of BOOSTRIX is affected by the reduced response to FHA and pertactin.